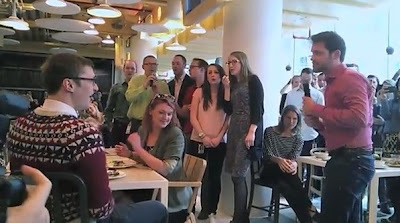 Google employee Shaun Aukland had all his colleagues from his London office help him propose to his boyfriend, Michael. We are a binational couple, separated for the last two years, on and off, without the ability to sponsor Michael for citizenship in the United States because of the Defense of Marriage Act. I flew to London for one of our regular trips and secretly to propose to Michael, in hopes that he'll be able to finally join me permanently in the US after the Supreme Court decision. Five minutes before the proposal, all of the TV screens in the cafe showed a timer countdown. At about 10 seconds, Michael remarked "its really busy in here. also, what is that timer". Then the video starts. Watch Shaun's sweet proposal after the jump.